Springbrook National Park is located in the Gold Coast hinterland, Queensland, Australia. The park is separated into a few sections. Within the park, there are a number of hiking trails, lookout points and parks to visit. Do take look under Contact to get updates on the park alerts prior to visiting. There is no public transportation available. Consider renting a car and self-drive. The road conditions within the park are good. Some sections of the road can be winding and should be travelled with care. Ensure you have sufficient petrol to get around as there is no petrol station within the park. To Natural Bridge Section: Nerang-Murwillumbah road, state road 97. This connects between Gold Coast suburb, Nerang to New South Wales. From Nerang, it is about 30-45 minutes drive of about 35km to reach Natural Bridge. To Springbrook plateau: Goldcoast-Springbrook road, state road 99. This road leads to Gold Coast suburb, Mudgeeraba which leads to Pacific Highway M1. From Mudgeerba, it is about 30 minutes drive of about 25km to reach Springbrook Section. The Goldcoast-Springbrook road is connected to Nerang-Murwillumbah road via Pine Creek road. This essentially connects the Natural Bridge section with Springbrook plateau. The distance by road is about 30km away which take about 30-40 minutes of driving. To Mount Cougal Section: Currumbin Creek road, which links to state road 98. State road 98 connects to Gold Coast suburb, Currumbin. This road does not connect to the other parts of Springbrook National park. There are a number of trails with a good selection of distance and difficulty for you to choose from. The trails are graded accordingly to the Australian Standards. Natural Bridge circuit Class 2 1 km About 1 hour The trek takes you across Cave Creek and into the arched cave to witness the waterfall plunging from above. At night, thousands of glow worms illuminate the cave with tiny green lights. See below for more information. Canyon lookout Class 1 30m About 5 mins Step out of your vehicle and you’re there! Take in the superb views of Twin and Rainbow falls, the sheer walls of The Canyon and the ocean beyond. See below for more information. Wunburra lookout Class 2 30m About 5 mins Wunburra lookout has views of Purling Brook valley, Mount Cougal and the Little Nerang Dam. See below for more information. Goomoolahra Falls lookout track Class 2 200m About 5 mins Several lookout at the top of the 60m high Goomoolahra Falls. On a clear day the north facing views stretch to Stradbroke and Moreton islands and Moreton Bay. Best Of All lookout track Class 2 600m About 30 mins Walk through ancient Antarctic beech forest to a view of northern New South Wales dominated by Mount Warning. Twin Fall circuit Class 3 4 km About 2 hours Pass behind two waterfalls, through rock clefts and among palms and tree ferns. See below for more information. Purling Brook Fall circuit Class 3 4km About 2 hours Pass through open eucalypt forest of New England ash Eucalyptus campanulata before descending into the gorge to view the falls from below. Warrie circuit Class 4 17 km About 6 hours The longest and most interesting track on the plateau follows the base of The Canyon cliffs to Goomoolahra Falls before descending into the mossy green depths of the rainforest. Cascades track Class 2 1.6 km About 1 hour Walk through subtropical rainforest beside Currumbin Creek to a viewing platform overlooking scenic cascades. Drive to GPS coordinates -28.230479, 153.242194 (google map) and park in the vicinity. The entire circuit is about 1km long walking on boardwalk / pavement and stairs. Walking in an anti-clockwise direction, the circuit will first take you down as many as 100 steps (or maybe more) to the bottom of the cave to see the glow worms (at night) and waterfall from the bottom. Continuing on the circuit route, you will start an incline climb going to the top of the waterfall where you will see water gushing down the hole. Drive to GPS coordinates -28.220813, 153.272744 (google map) and park in the vicinity. Walk a stone throw away to reach the Canyon Lookout. Looking directly ahead, you will see the walls of the Canyon and an unblock panoramic views of the area. The Canyon are a result of millions of years of erosion, landslides and weathering. If you are heading towards Springbrook Plateau, you will drive by this lookout point which is located at the beginning of Springbrook road, right after Pine Creek Road or Gold Coast-Springbrook Road. Park at the small area on your right at GPS -28.159896, 153.266010 (google maps) and walk a few meters against the traffic flow towards Wunburra lookout point. Definitely worth it to stop by to take a photo of Purling Brook valley, Mount Cougal and the Little Nerang Dam. Drive to GPS coordinates -28.224488, 153.270930 (google maps) and park around the vicinity of Tallanbana Picnic area for better amenities like toilets and sheltered picnic tables. The parking area is generally small and can get crowded. There are no boardwalks here and be expected to be walking on soil. Walking in an anti-clockwise direction, you will pass by the Twin falls and subsequently Blackfellow falls whereby you will need to walk behind the falls to continue on the circuit. On the circuit route back to Tallanbana Picnic area, you will pass by the Canyon lookout point. Consider doing a detour to the Rainbow falls (about additional 300 meters one way) to catch an additional waterfall, and if lucky, sighting of the rainbows. There is no cost involved unless you are camping within Springbrook which requires a permit application. You can get information about camping at Springbrook here. 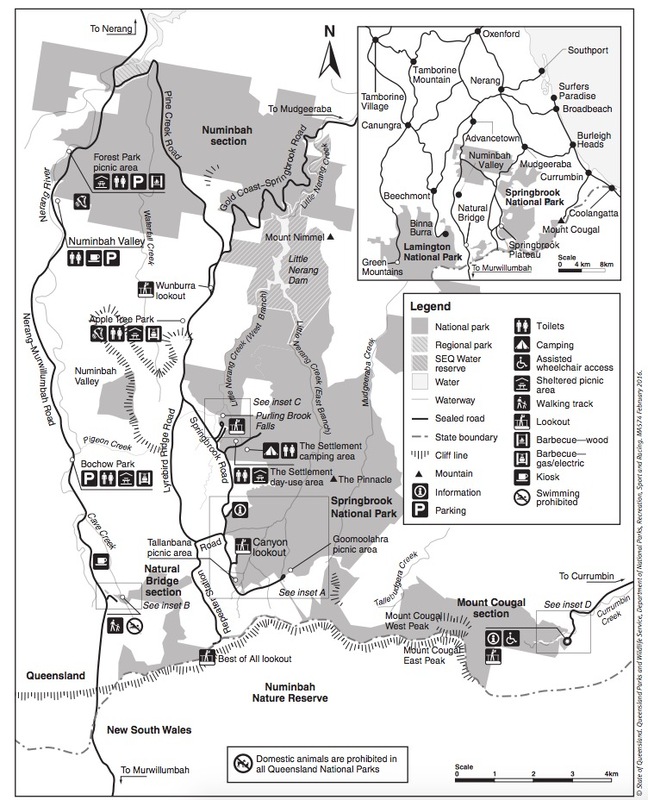 The Springbrook National park website is well maintained and updated with information about trail closure, park alerts, maintenance, maps and more. Hope You Find The Hiking Guide Helpful! Share My Hikes is a hiking destination guide which allow fellow hikers to freely edit, update and contribute contents to it. We rely on the community effort to keep the guide updated. Find out more about the guide's aspiration at our FAQ page. What is Share My Hikes? Share My Hikes is a hiking destination guide which allow fellow hikers to edit, update and contribute contents to it. Hiking information can get outdated overtime. Therefore, the guide features an editor function which allows anyone to freely edit and update the hiking guide's contents. We encourage hikers to play a part in sharing hiking information for the greater good of the community. Watch the intro video or read the FAQ to find out more. The community needs your help. Contribute new hiking destination or keep the hiking information updated by editing directly on our articles. This is an open-content collaborative by the community. Hence, the contents are not reviewed prior to publishing and it's validity cannot be guaranteed. Pls do your own due diligence and use the information at your own risk. We accept no responsibility or liability for any loss or damage whatsoever arising from the information provided herein.